Down’s syndrome (often also called Down syndrome) is a genetic condition – people with DS have three copies of chromosome 21. Around 775 babies who have DS are born every year in England and Wales – that’s about the rate of one in 1,000 babies. Down’s syndrome causes some level of learning disability, and people with DS often share characteristic physical features. The condition is named after John Langdon Down, the British physician who first identified the common characteristics of the syndrome. This video is a fantastic explanation – grab a cuppa and enjoy! The myth: People with Down’s syndrome cannot achieve normal life goals. The truth: With the right support, they can. Small but increasing numbers of people with Down’s syndrome are leaving home and living with support in their communities. They are gaining employment, meeting partners and getting the best out of life. The myth: Only older mothers have babies with Down’s syndrome. The truth: Although older mothers have a higher individual chance of having a baby with Down’s syndrome, more are born to younger mothers, reflecting the higher birth rate in this group. The myth: People with Down’s syndrome don’t live very long. The truth: Today, people with Down’s syndrome are living into their 50s and 60s with a small number living into their 70s and beyond. The myth: People with Down’s syndrome all look the same. The truth: There are certain physical characteristics that can occur. Each person will have a number of the more common physical characteristics. 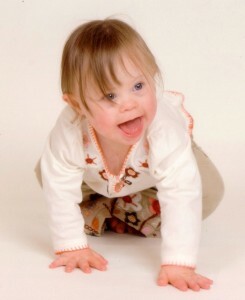 A person with Down’s syndrome will always look more like his or her close family than someone else with the condition. The myth: People with Down’s syndrome are always happy and affectionate. The truth: We are all individuals and people with Down’s syndrome are no different to anyone else in their character traits and varying moods.